Computerized diagnosis for the benefit of your health. 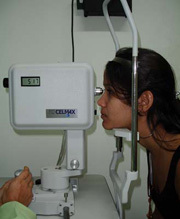 We perform a variety of ophthalmological examinations using state-of-the-art equipment. This exam is essential for the diagnosis and treatment of glaucoma, and neurological disorders with visual impairments. This exam detects eye tumors, hemorrhages, foreign bodies, crystalline lens luxation, retinal detachment and all kinds of injuries that can affect a person's vision. Specialized equipment used to measure the power of the intraocular lens that will be used during cataract surgery. This exam determines the size, shape and number of corneal endothelial cells. It is performed before intraocular surgeries, pathologies of the endothelial layer, penetrating ocular trauma, etc. This study is essential to determine the causes of infections such as blepharitis, conjunctivitis, corneal ulcers and endophthalmitis. This exam uses ultrasound to measure corneal thickness and determine structural and / or degenerative corneal disorders.